Cedar trees come in a number of varieties and need very little maintenance. 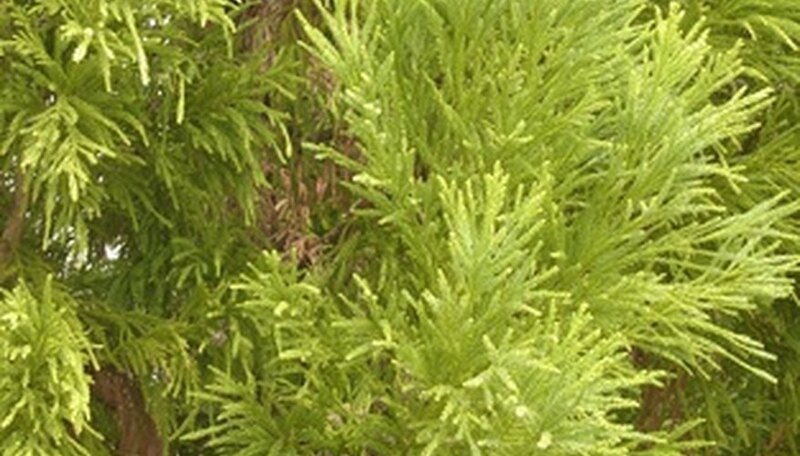 Cedars are evergreen trees with a distinctive scent. Cedar wood has been used for many years to make trunks and closets to store clothing and other cloth articles because the resin in the wood repels moths. The resin also repels water and the wood is used for roofing and siding material for buildings. In the home landscape, the trees are normally planted for their quick growth, large size and winter color. Water newly planted trees for three hours in the morning and two hours in the evening for the first two weeks. Cedar trees need watering only during dry periods after that. Apply a handful of bone meal to the soil five months after planting. Cedar trees are not heavy feeders and don’t need to be fertilized unless the soil is very poor. Use a 15-30-15 fertilizer once a year in the spring to renew the nutrients in the soil. Pick weeds around the tree by hand for the first growing season. Place 5 inches of cedar mulch around the tree in the fall to hold in moisture and keep weeds from sprouting in the spring. The mulch will decompose over the next growing season so adding more each fall will be necessary. Place a chicken wire enclosure around a young tree in the fall and leave it there until mid-spring. This will keep rabbits and deer from eating the foliage from the tree. Spray the tree with horticultural oil in the early spring. Horticultural oil is used to prevent spider mites from getting on the tree. If spider mites are already present, use a miticide first to kill them. What Do You Call the Leaves on Cedar Trees? What Happens to Trees in Winter?